This is the second installment in our weekly series, Wedding Cakes 101. Today, we will talk about wedding cake icings, flavors and fillings. The two most popular types of icings are buttercream and fondant, however several others are also available. Buttercream is the traditional icing that you see on store bought cakes, anywhere in Canada. This creamy, rich icing is made almost entirely of butter. It's easy to color and flavor, so it's very popular in wedding cakes. Buttercream will melt in extreme temperatures, so avoid this icing if you are hosting an outdoor wedding reception. This wedding cake from How Sweet in Calgary features buttercream icing with dotted details, topped with vibrant fresh flowers. This icing is made from sugar, gelatin and corn syrup. The fondant is rolled out with a rolling pin and then draped over the cake and pressed into shape. It looks very smooth and hard. Fondant can be decorated with gum paste flowers, marzipan (Italian almond paste) or ribbons of icing. It does not need refrigeration, therefore it would make a great option for your beach wedding. 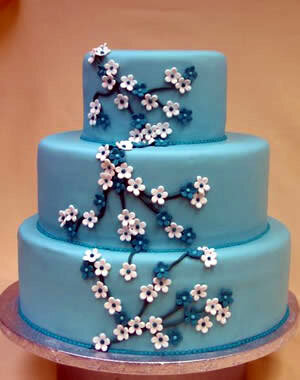 Blue fondant was used to create this wedding cake from Tartlets in North Vancouver. This dark icing is blend of heavy chocolate and cream. It can be poured over a cake as a glaze or used as a filling between layers. It can't handle the humidity or heat well at all, so use sparingly. Made from a mixture of confectioner's sugar and milk (or egg whites), this shiny, hard icing is the type you may often see on gingerbread men. 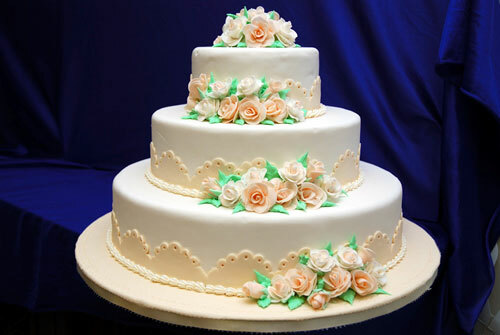 On wedding cakes, it's normally used to create latticework, dots and other decorations. Fresh whipped cream is delicious, but it's not practical for wedding cakes since it must be refrigerated. If you have a small reception where you are serving all the cake immediately, you can bring it out of the refrigerator at the last second before serving. 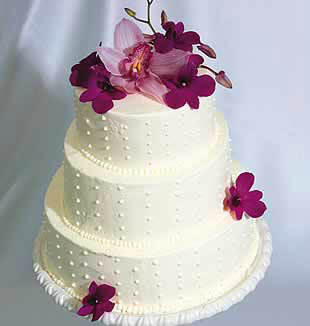 Other substances can be used to create wedding cake decorations. The most common is gum paste, a blend of gelatin, corn starch and sugar. Gum paste is utilized to create realistic flowers and other decorations. Marzipan is a blend of almonds, sugar and egg whites that is colored and molded into flower and fruit decorations. Marzipan can also be rolled and used to cover cakes. Piping is the decorative icing that comes after a pastry bag and is used to create basketweave, latticework, shells, dotted Swiss and other intricate wedding cake decorations. This beautifully decorated cake, featuring gum paste flowers, is from My Pink Apron in North York. When choosing your wedding cake, the inside of the cake is just as important as the outside. Gone are the days of traditionally white wedding cake. Now you can choose any flavor of cake imaginable. Vanilla almond is the traditional wedding cake flavor. This is the simple white cake that has been used for centuries. Most bakeries offer a moister version of vanilla cake, as well. When sampling wedding cakes, consider that most bakeries offer a few classic flavors, along with specialty flavors that are more expensive. If you are planning your wedding on a budget, one of the classics will do. Wedding cakes can be filled with just about anything - fresh fruit, jams, buttercream, liqueur, mousse, cream cheese, custard, whipped cream and more. In recent years, raspberry jam filling, rum cream filling, hazelnut cream filling and Grand Marnier filling have become top choices.